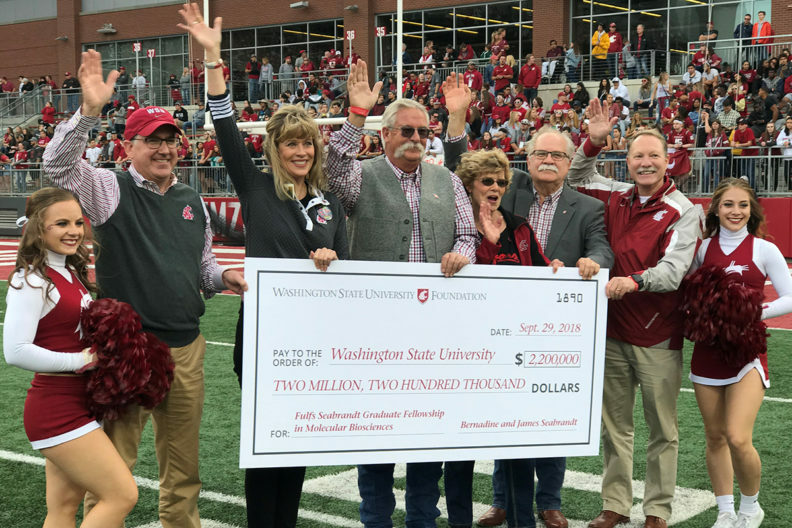 A $2.2 million check from the estate of Bernadine and James Seabrant was presented during halftime at the Sept. 29 WSU vs. Utah football in Martin Stadium. Presenting the check was Bernadine’s nephew Jack Fulfs and his wife Linda (center). Seen above are WSU President Kirk Schulz (l-r); Lisa Calvert, vice president of advancement; Jack and Linda, Bryan Slinker, dean of WSU’s College of Veterinary Medicine; and Mike Konkel, senior associate director of the School of Molecular Biosciences and Professor of Microbiology. A $2.2 million gift from the estate of Bernadine and James Seabrandt will create the Bernadine Fulfs Seabrandt Graduate Fellowship in Molecular Biosciences at Washington State University’s School of Molecular Biosciences. This is the largest private gift received by the program since its founding in 1998. The fellowship will be awarded to graduate students who are focused on health research. Recipients also will gain research expertise that is interdisciplinary, spanning the areas of cellular, molecular and structural biology, and receive focused training in biochemistry, cell biology, genetics or microbiology. “A major focus of WSU’s School of Molecular Biosciences is our graduate program,” said Michael Griswold, director of the School of Molecular Biosciences, which is part of the College of Veterinary Medicine. “The school offers many opportunities for graduate students to contribute to fundamental research in a variety of disciplines, including infectious diseases, food-borne bacterial pathogens, reproductive health, DNA repair, or cancer and cancer therapies. Graduates of the program will typically enter careers in medicine, biochemistry, biophysics, cell biology, genetics, immunology, microbiology, molecular biology, structural biology or virology. Raised on a farm near Pullman, Bernadine Fulfs attended WSU (then Washington State College) earning a Bachelor of Science (’41 BS) in medical technology and a Master of Science (’54 MS) in microbiology from the Department of Bacteriology and Public Health, now the School of Molecular Biosciences. She met Jim Seabrandt in class at WSU while working as a teaching assistant. Jim also earned two degrees at WSU (’55 BS; ’58 MS). After graduation, Bernadine worked as the chief microbiologist at Deaconess Hospital in Spokane. She retired in 1974 and they moved to Bay City, Oregon. Jim passed away in 1995. Bernadine returned to Pullman one year before her death in 2015. Bernadine’s family still farms just outside of Pullman and they are active in the WSU community.